Water Quality in Singapore: More power to rainwater harvesting in Singapore! 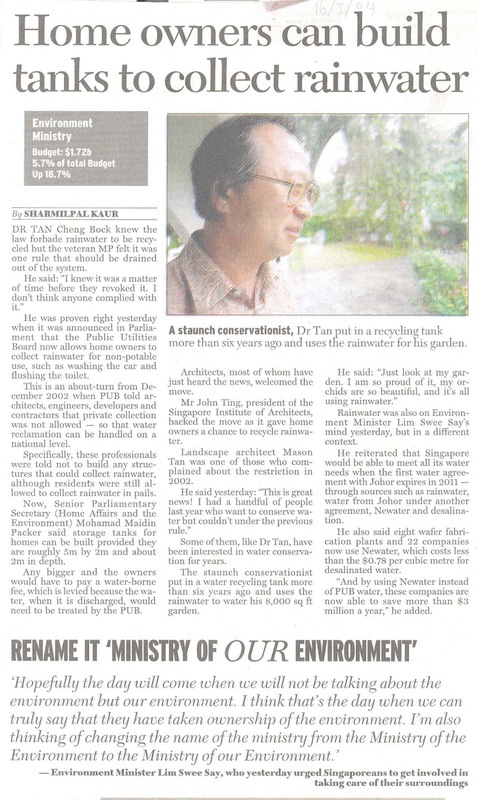 It has been a long while (Mar 2004 till now to be exact) since Dr Tan Cheng Bock (Singapore presidential candidate in 2011) advocated water conservation by implementing a rainwater collection tank to water his garden despite the illegal nature of such an act before that time. See Straits Times article below (dated 16 Mar 2004). Since then, even though not widely known, rainwater harvesting has been legalised for households as long your rainwater storage tank is no bigger than 5x2x2m (or you will have to pay a levy for wastewater treatment) and your rainwater is for non-potable uses. Institutions and companies will have to apply for a permit if they want to implement rainwater harvesting. Still, many got their permits e.g. Changi Airport (1, 2), Nanyang Polytechnic, Poh Ern Shih Temple. But now, it is official! This page also includes grey water recycling (I will cover this in a separate post) which is now officially recognised too! How exciting! Owner/developer/QP/PE can submit an application to PUB for rainwater harvesting. Please note that rainwater is only (and still) for non-potable use. Not surprisingly, rainwater harvesting equipment has to comply with the Code of practice for water services and the fittings must follow the standards under PUB. What are your non-potable options in the use of rainwater? Excess rainwater should be allowed to overflow into drains which of course goes back to becoming the property of PUB. Don't forget the other governmental big brother, NEA. Your rainwater system also has to comply with NEA's guidelines, especially concerning mosquito breeding. Guess what... gutters are now allowed (though "discouraged") for rainwater harvesting provided they follow the guidelines given here. The same rainwater is not supposed to remain for more than 7 days in the storage tank (translated as residence time to the engineer reading this). A big document - 82 pages. More for further info and background. Well and good. People should have a role in conserving and utilising this precious resource. No doubt, centralised rainwater harvesting by PUB is indeed useful. However, the people need to be allowed more freedom for initiative to take care of themselves and the environment. Personally speaking, rainwater is really clean water. The possible contaminants will be dust and dissolved gases and whatever that adds into the water by the collection system e.g. bird droppings, dead insects. After some minimal treatment, rainwater is certainly potable. As mentioned in a previous post, I strongly suggest rainwater as compared to other sources for consumption rural/developing communities overseas. 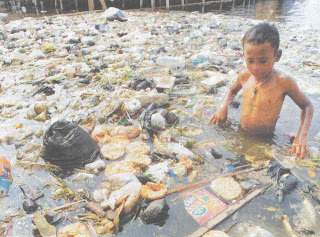 Figure: Source: Straits Times c2003. 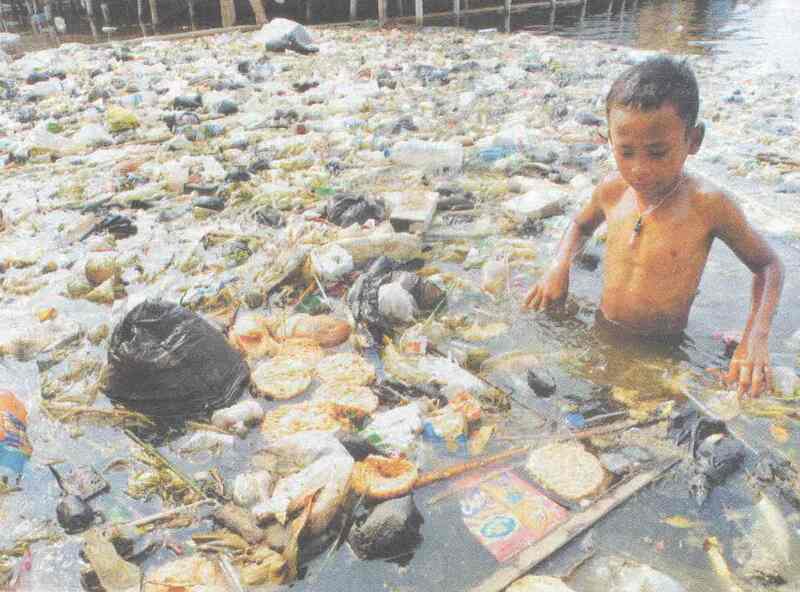 Rubbish choked water in Muara Baru, north Jakarta. I don't know about you but I prefer to get my water from the rain rather than from surface water like this. Great idea to promote rain water collection system.